I have a background in education, and Childcare has been a part of my life ever since my first babysitting class at the age of twelve. 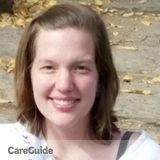 I worked as a daycare provider throughout highschool, then went on to work for three years in a respite care facility for children ages six to twenty one. I have experience in working with children ranging from newborn to teenager, and I have been blessed to work with a variety of special needs. I am married, and my husband and I are blessed to be raising our two month old son. Hi Im Monique and I offering babysitting and house cleaning as well as meal preparation.